he ambitious Scottish publisher Alexander Strahan (c.1835-1918) was only in his mid-twenties when he launched what would become one of his greatest achievements, the periodical Good Words, with Norman Macleod, who was a royal chaplain for Scotland, as its editor. After the success of Good Words, which achieved an enormous circulation, Strahan launched The Sunday Magazine in October 1864 as another periodical suitable for reading on the Sabbath, but intended to appeal to a more strictly Sabbatarian readership. Two more monthly periodicals were founded by Strahan in quick succession; in December 1865 he launched The Argosy and in January 1866 The Contemporary Review. In 1868 Strahan expanded his range of periodicals still further with a magazine specifically targeted at children, Good Words for the Young. Good Words for the Young, which has been described as ‘one of the finest magazines ever aimed at youth’ (Goldman, p.48), was a development from Good Words intended for a younger audience. Strahan’s aim was to provide ‘wholesome’ literature for children at a time when mass-produced cheap reading material was being produced for the juvenile market; he promised to supply ‘such literature as will not ignobly interest nor frivolously amuse, but convey the wisest instruction in the pleasantest manner’ (quoted in Lang, p.22), and he believed that high quality illustration could enhance improving literature (Srebrnik, p.3). 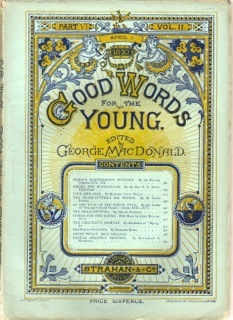 When Good Words for the Young was launched in November 1868, with Norman Macleod as its first editor, its list of authors included both Charles and Henry Kingsley, Dinah Maria Muloch Craik, ‘Sarah Tytler’ (Henrietta Keddie), Jean Ingelow, William Brighty Rands, Hans Christian Anderson, George MacDonald and Norman Macleod: all established writers of children’s and adult literature. It was well presented and imaginatively illustrated, and set a new standard for children’s periodicals. As in its parent magazine, the engravings were in the hands of the Dalziel Brothers, who later described Strahan as a man of ‘great taste both in literature and in art’ (The Brothers Dalziel: A Record of Work, p.158). The first issue of Good Words for the Young opened with ‘Madame How and Lady Why’, by the Rev. Charles Kingsley, followed by ‘Child-World’, a set of poems by Miss (Menella Bute) Smedley, and the first chapters of what would become George MacDonald’s most famous story for children, his faerie-allegory ‘At the Back of the North Wind’. Later issues contained William Gilbert’s ‘King George’s Middy’, and Henry Kingsley’s ‘The Boy in Grey’. The contents included a range of genres: serialised stories, poems – both humorous and contemplative, articles on natural history, pieces on historical events, playlets – ‘Revels’, and short informative and philosophical pieces, labelled as ‘Lectures’. Tom Hood, the humourist and illustrator, also wrote and illustrated extensively for the periodical, and George MacDonald, one of its most important contributors, supported the magazine by writing poems and stories; these appeared for over four years. As was typical of the period, some contributors to the periodical avoided using their own names, or were referred to in its index as ‘By The Author of . . . ’; William Brighty Rands wrote humorous poems as ‘Matthew Browne’, but he also wrote articles and stories as ‘Henry Holbeach’, and Richard Rowe wrote ‘The Boys of Axelford’ under the pseudonym ‘Charles Camden’, as well as using his own name for other material. 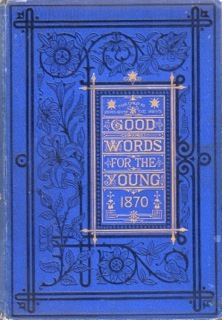 The first monthly issue of Good Words for the Young contained 64 pages with 52 illustrations of varying sizes including a frontispiece, but the average issue length was 45 pages with up to 30 illustrations; The Amalgamated Robin Redbreasts, the Christmas Issue of Good Words for the Young for 1869, contained 54 pages with 22 illustrations. The annual volumes, which consisted of issues from November of one year until October the next, were strikingly bound in royal blue cloth with titles and decoration blocked with gilt and black and priced at 7s 6d. The artists whose designs were commissioned in the first year of the periodical included Arthur Hughes John. Pettie, Francis Arthur Fraser, Johann Baptist Zwecker, Ernest Griset, W. S. Gilbert (who illustrated his father’s story ‘King George’s Middy’), W.J. Weigand, Arthur Boyd Houghton, Edward Dalziel, Thomas Dalziel, William Small, Tom Hood and George Pinwell. There was a good mixture of illustrative styles, matching the contents of the texts for which they were designed, and the illustrations ranged from sentimental images of domestic life to drawings from nature, depictions of historical events, caricatures, and designs to complement fantasies and fairy tales. Arthur Hughes, the ‘chief illustrator’ of the magazine (White, p.78), supplied 234 illustrations between 1868 and 1873, including designs for George MacDonald’s ‘At the Back of the North Wind’, ‘Ranald Bannerman’s Boyhood’, ‘The Princess and the Goblin’, and ‘Gutta Percha Willie’; for Henry Kingsley’s novel, ‘The Boy in Grey’; for William Brighty Rands’s ‘Lilliput Lectures’ and ‘Lilliput Revels’; and for William Gilbert’s ‘Sinbad in England’, all of which were subsequently published in book form. We may be wrong (and we hope it is so) but we imagine Good Words for the Young, edited by Mr. MacDonald, has not met with the success it deserves. We confess to reading it from end to end as it appears, and this is more than we can venture to do with its graver and older brother — Good Words [quoted in Lang, p. 24]. Illustrations were key to Strahan’s vision for Good Words for the Young and were in many cases imaginatively laid out on the page to create an eye-catching effect. But commissioning designs was expensive and by 1872–73 Arthur Hughes, a loyal friend of both George MacDonald and Alexander Strahan, was the only artist of significance still providing illustrations for the periodical. The last contribution made by George MacDonald, a set of poems, ‘Cottage Songs for Cottage Children’, was illustrated by Hughes and published in November 1873. George MacDonald was not only the periodical’s major contributor of serials but also acted as its editor for three years, taking over this role from Norman Macleod in October 1869. By this time publisher and author had established a very productive and creative relationship, as well as developing what appears to have been a close personal friendship. But for the third and fourth years of Good Words for the Young MacDonald, who had begun his editorship with a promised salary of £600 per annum, fulfilled this role ‘without remuneration’ out of loyalty and friendship (George MacDonald and his Wife, p. 361). When MacDonald left for a lecture tour in America in September 1872, he was no longer able to continue as editor of the by then failing periodical, and by then Strahan was also facing financial disaster. Strahan was an innovative publisher with an innate sense of what would appeal to the market, but he was over generous in his payments to authors and extravagant in his business dealings generally. By the late 1860s he was heavily in debt to his stationers, Spalding and Hodge, as well as to fellow publisher James Virtue, and was struggling to survive as a publisher in his own right, with mortgages against four of his principal periodicals secured by the copyrights to Good Words, The Sunday Magazine, The Contemporary Review, and The Argosy. Strahan had borrowed £4,000 in 1863; £6,000 in 1864; £15,000 in 1866, and the entire sum of £25,000, plus interest was due to be repaid by March 1870 (Srebrnik, pp. 63-4, 66, 88). These were vast amounts in a period when the average middle-class income, with enough to run a household and several servants, was £900 per year. On 1 March 1872 Strahan was forced to retire from the the firm that bore his name, leaving his partners James S. Virtue and William Isbister to continue with the business of Strahan & Co. Under the terms of his retirement, Strahan was prohibited from using his own name until December 1873 and his periodicals were distributed by Henry S. King. Strahan retained the part of his previous publishing list that was un-mortgaged, and came to an arrangement with King for the publication of Good Words for the Young, with a change in its title to Good Things for the Young in late 1872 (Srebrnik, pp.117-23, 129). Strahan returned to publishing Good Things under his own imprint in 1874 (Srebrnik, p. 136), but the periodical’s demise in 1877, after several minor modifications to its title, was brought about by the economic necessities of a falling circulation: a reduction in the quality of its contents and the use of inexpensive foreign clichés instead of commissioned illustrations (White, p. 77). Brothers Dalziel, The: A Record of Fifty Years’ Work. London: Methuen, 1901. Goldman, Paul. 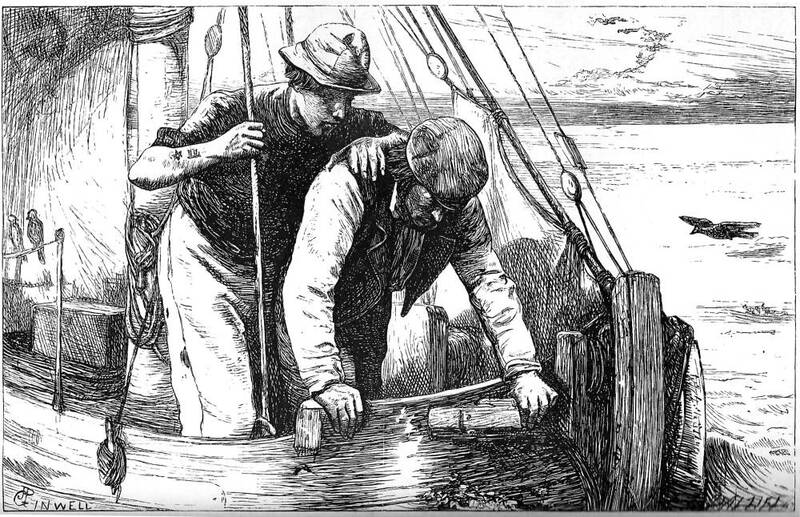 Victorian Illustrated Books 1850-1870: The Heyday of Wood-Engraving. London: British Museum Press, 1994. Good Things for the Young. London, Henry S. King, 1873. Good Things for the Young. London, Strahan, 1874. Good Words for the Young. London, Strahan, 1869–72. Lang, Marjory. 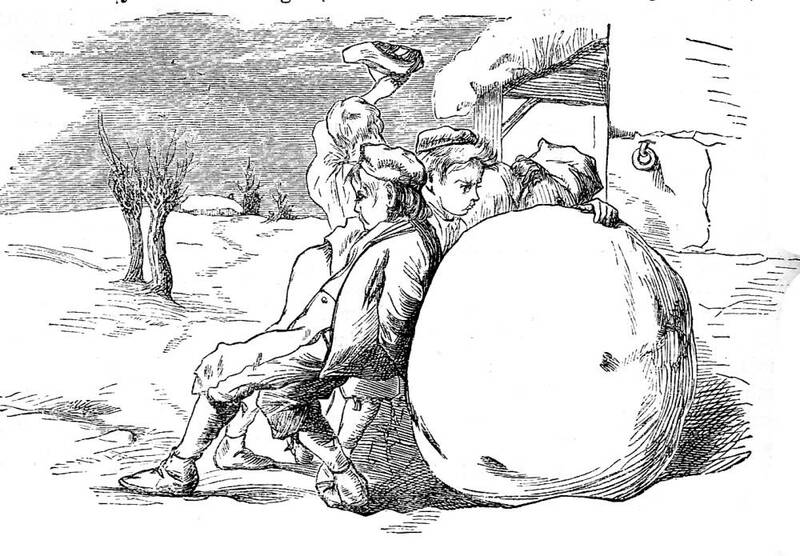 ‘Childhood's Champions: Mid-Victorian Children’s Periodicals and the Critics’. Victorian Periodicals Review 13, 1/2 (1980): 17-31. MacDonald, Greville. George MacDonald and His Wife. London: George Allen & Unwin, 1924. Srebrnik, Patricia Thomas. Alexander Strahan: Victorian Publisher. Michigan: University of Michigan Press, 1986. White, Gleeson. English Illustration: ‘The Sixties', 1855-70. London: Constable, 1897.